After a bill has been read a third time and passed in the House of Representatives it goes through the process of being given the royal assent, at which point it becomes law. In New Zealand the sovereign's representative, the governor-general, gives the royal assent. 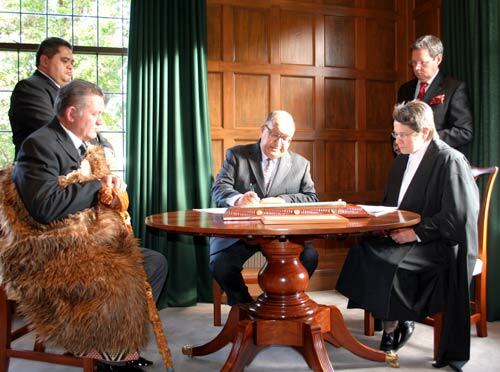 Here Governor-General Anand Satyanand signs into law the Waikato–Tainui Raupatu Claims (Waikato River) Settlement Bill on 7 May 2010. Looking on is the Māori King Tūheitia (seated, left), his private secretary, Rangi Wallace (standing at left), Mary Harris, clerk of the House of Representatives (seated, right) and Robert Taylor, official secretary at Government House (standing at right). The Waikato River legislation followed the Waikato–Tainui Raupatu Claims Act 1995, which provided redress for the confiscation of Waikato–Tainui lands following war in the 1860s. On the table in front of Satyanand is the ceremonial mere Te Raupatu, which was gifted to the Crown when a settlement was finally reached.